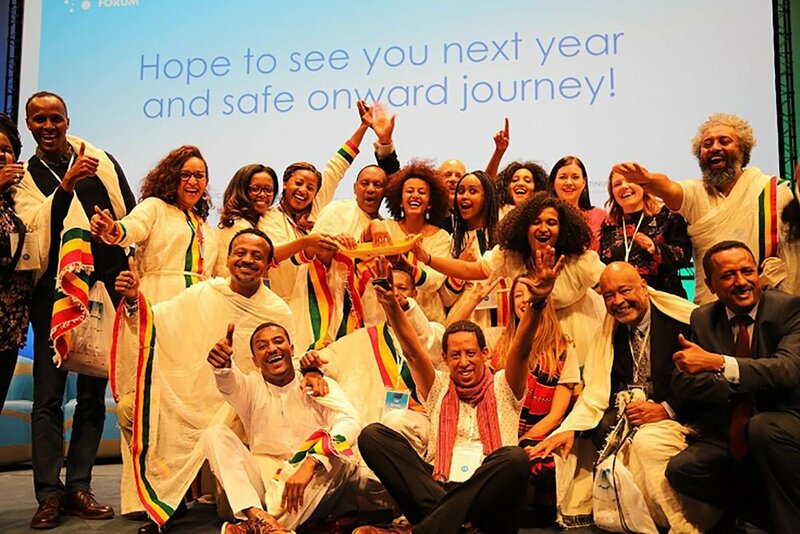 Adenew Mesfin (pictured in white), with other members of the Ethiopian delegation at SEWF ‘18. Adenew Mesfin initially began his working career in the private sector. He then changed direction and moved into the not-for-profit sector. He has extensive experience of over 17 years in the development sector, specifically in fundraising and project management. He spent the early years of his career in the UK and now lives and works in Ethiopia. He is the Project Manager of the Social Enterprise World Forum 2019 at the British Council. Adenew discusses what to expect from the upcoming Social Enterprise World Forum to be held in Ethiopia in October, whilst sharing insights into the broader movement and key opportunities for social entrepreneurs. [Tom Allen] - Could you please share a bit about your background and what led you to working in the social enterprise space? [Adenew Mesfin] - I started my work career in finance in the private sector and at one point when I was made redundant, I decided to move to the not for profit sector and I've been working in the sector for the past 17 years or so. I was working in the United Kingdom and moved to Ethiopia about 10 years ago. I continued working in the development sector, and I was working with British Council also in the intercultural sector. I also ran my own business some years ago in Ethiopia for about three or four years, and I'm not really a natural business person. I'm not a very good capitalist, so to speak. Then I heard about the social enterprise sector and came back to the British Council for the Social Enterprise World Forum program. It was like a life changing realisation that you can do business with ethics. You can do business for a common good. It was not all about just accumulating money, but actually providing a service that was worthwhile, supporting the community. I became an ardent, passionate supporter of the social enterprise through that. Wonderful. Well, you're certainly creating a lot of momentum in the space at the moment, Adenew. You're currently one of the key project managers of this year's Social Enterprise World Forum, which will be held in Addis Ababa in Ethiopia in October. So what are you most looking forward to about the forum, and for those who are considering going, what can they expect? What we're offering is not just the Social Enterprise World Forum, not just the forum itself. What we're offering is a unique experience. It's the first time that the forum is coming to an emerging market economy, and then the forum itself, the usual networking, learning, bunch of opportunities are there, but in a different context. Ethiopia has a unique history and so there are so many things in terms of the social enterprise sector to see within the Ethiopian context, which has gone back a long time. Our strapline for this year's forum is local traditions, fresh perspectives. The reason we use the word traditions is because Ethiopia has a long history of social enterprise engagement, not under the label of social enterprise, but social enterprise is about living and supporting the community, living that way. Ethiopia has 2000, 3000 year old traditions like a thing called a Equb and Iddir which really work on the same principle of social enterprise. It's trying to showcase these different social enterprise ways of living that Ethiopia has enjoyed for the past 2000, 3000 years. That's fantastic, and also Ethiopia also offers 9 world heritage sites across the country. We're going to try and do some study tours to these world heritage sites and also viewing social enterprises around those different locations. Such a rich cultural history in Ethiopia, Adenew, so it's really exciting to consider that the forum is heading there this year. For the social entrepreneurs who are going to travel from around the world to attend the world forum, what are some of the unique places or organisations or things that you would recommend for them to see or visit? Do you mean from the social enterprise angle or from the touristic historical angle? Let's start from a social enterprise angle, but I'd love to hear of some of the wider tourism perspectives as well. Well, we have a number of different social entrepreneurs, very vibrant social entrepreneurs. I think Tebita Ambulance is a really interesting ambulance service. It's the first private ambulance service in Ethiopia and they take anyone who needs medical attention to a hospital, and they will only charge people who can afford to pay it. If you're ill and you arrive at a hospital and you don't have enough money or don't have any money to pay for the ambulance service, then they're happy to just drop you at the hospital to be treated. So they are good. There's another fantastic one who works on Moringa. Moringa, I'm sure you're familiar with it, is one of these super foods in Ethiopia grown in the southern part of Ethiopia. It grows naturally, and the organisation is trying to cultivate it and export it and also sell it around Ethiopia, because it's like a multivitamin, a natural multivitamin, multi-mineral leaf. So that's wonderful. Then there's a really fantastic partner of ours, Bethlehem is her name. She's 19 years old, in fact just turned 20, and she is dynamic. She started her life as a coder. She was working with government security services when she was 10 years old. 10 to 12, she worked there. Now at 16, she had this realisation that she needed to go back to the community to support other girls. She's now helped 20,000 girls learn coding in Ethiopia. She is absolutely brilliant. There's some really, really fantastic, vibrant social entrepreneurs to see and to meet and to learn from. What do you believe other nations can learn from Ethiopia's unique approach to social enterprise? I think in some ways it's going back and going forward in a way; local traditions, fresh perspectives. I said that there's an ancient institution called Iddir. Iddir is where, when somebody dies in Ethiopia, we have a mourning period of normally seven to 14 days, and at that time people sit on a wake, it's expensive. The family would have lost somebody obviously significant, and so the rest of the community rally round. What they do is, on a monthly basis, people put money down, (it could be a small amount). It's organised in different localities, and so maybe a hundred members will put five birr down per month. One person has a loss, the others come, they provide furniture, seats, cooking pots. They also help cook, they help serve, they help with the funeral arrangements. That's an age old tradition. What one of our partners does is they have started branching out into the enterprise sector. They started with opening a small convenience store, and then when we went to visit them a few months ago they owned a butchery, they owned a restaurant and they now have opened a school where 75% of the community go for free and 25% pay to go there. It's just injecting a modern perspective and entrepreneurship perspective to old traditions. It's a really interesting example, Adenew. Thanks for sharing that. What do you think have been some of the key factors then that have helped develop the social enterprise movement in Ethiopia? I think more and more different incubators, impact investors are coming in, are in town now. The British Council also has a program, which is about three to four years old, but other partners like Reach For Change have also been working in that space even longer than us. Social enterprise, even from the international angle, is getting more attention. The African Union are beginning to look at it too. There's a wave, and not only just in Ethiopia, but also around Africa; an awareness of what social enterprise is and how it can address eradication of poverty, [and create] inclusive economic growth. It's getting more and more focus, and we're trying to ignite more attention on Ethiopia and the African social enterprise space, and really notch it up one step. We also hope that the African Union, who are becoming a partner with us, will also promote it amongst their member states. We feel that the Ethiopian government is also a partner, and their focus is increasing in this space. That's fantastic. In observing and working with a range of different social entrepreneurs, Adenew, what do you believe are some of the fundamental ingredients of successful social entrepreneurs? There's never a uniform or a definition for social enterprise, but we in Ethiopia categorise it by criteria. The first criteria is that they have a core social mission to address, or environmental mission to address at the heart of their organisation. The second is that they reinvest any of their surplus into the community or into the business itself. They don't actually just accumulate the funds. It's sitting somewhere making money for them and not really contributing. The third item is that we ask, or we view them and ensure that no more than 75% of their income comes from grants. The reason it's so high is that often these enterprises start with startup support through grants or some other input, and so we're aware that most social enterprises have difficulty in financing, finding financing easily. So that's the third criterion, and then the final criteria is there they're an enterprise, and that is the wealth of the whole social enterprise sector that'll become sustainable. If you're an enterprise, if you're making money on addressing these problems, then you're much more sustainable. The old argument of ‘trade versus aid’ really comes to life in the social enterprise sector. Yeah, absolutely. What do you believe then are some of the most common reasons that social enterprises might fail? Is it due to, as you pointed out, a lack of focus on the business elements, or what would you say? Yeah, you touched the key button, which is really a lack of focus or a lack of skills in terms of the entrepreneur side. They, [social entrepreneurs], have a passion about what they want to address, but they often don't have the skills to manage the finances sufficiently. I went to visit a social enterprise a month or so ago, and they were saying that most of their members are uneducated, so they're not good with working on the finances and they have trouble with the government in terms of paying their taxes and submitting their tax forms, et cetera. There's a key skills gap I think in the sector, because it attracts so many people who want to do good and who want to work ethically, but haven't really reviewed their skills and ability to be able to run an enterprise successfully. I think that's where the problem is. The second problem is that financing is very difficult to get, because often they don't have much collateral or funds, and so it's harder to get financing for social entrepreneurs. Very common problems around the globe. You've already explained about the ambulance company and a few other really inspiring initiatives there, but I'm just wondering if you had come across any other organisations from Ethiopia which you believe are creating any fantastic, positive social change. Moving from sector to sector, there's a small but wonderful restaurant, and it's not the only one, there's more in Addis Ababa, which are social entrepreneurs. They take staff from the streets, often young girls who have come from the rural area and either fallen into prostitution or being working maids, but really an abusive environment. They take them, they train them to cook and serve and then they release them to get other jobs outside of the restaurant itself. They use much of their surplus really to reinvest in trying to support these girls, women to really change their life for the better. That's another wonderful and inspiring story, a narrative to tell. Absolutely. It sounds like a great restaurant. To finish things off then, Adenew, are there any particular books, resources, like websites or podcasts or other things you would recommend to our audience? Well, I would first recommend that they come visit our website. They'll be able to see our program and also some interesting related videos and information. The British Council itself has a huge resource, a web resource, which I will also recommend; British Council Ethiopia, but also British Council globally has a social enterprise website which I would recommend people visit. Also other partners, Reach For Change, Skoll, some of our own partners in Ethiopia too are great to look at, and you'll see them featured often on the British Council Ethiopia page. I recommend that people visit that, but also the SEWF online page to see previous Social Enterprise World Forums, what their focuses were, what they featured. That's another great resource. Then of course, Impact Boom is another one they're obviously visiting and should visit, because they're providing up to date news, and as a media partner of the Social Enterprise World Forum, you are also key in terms of passing information onto people who are interested. Some good resources there Adenew. I'd like to say a sincere thank you to you and to the wider team who've been organising what's sure to be an amazing SEWF this year in October in Addis Ababa. Thank you so much, Tom, and we want to welcome everyone over to Addis Ababa. Come and really sample social enterprise, and also the unique tradition, culture of Ethiopia, as one of the oldest countries in the world. Bethlehem - coding for girls. You can contact Adenew via the SEWF 2019 website. Please feel free to leave comments below. Find other articles from previous SEWF speakers or interviewees which discuss the forum.